I’ve tried being positive this month by making a few changes in my life. 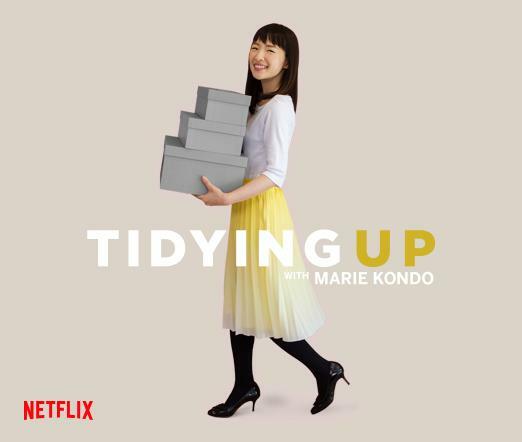 I started watching the Marie Kondo show on Netflix recently and was really inspired by her mantra ‘Does it spark joy in your heart?’. I decided to get some joyous sparks in my heart by starting to de-clutter around my home. I started with my office first. I have a chest of drawers that’s full of paraphernalia that I am rather attached to. I’m afraid there’s nothing of use in it besides the hordes of gift-wrapping papers and ribbons. Even those are rarely used these days because everyone seems to be using gift bags that can be recycled. That’s just one drawer. Half an hour into the exercise, I got discombobulated. Why did I start something that will take me days to finish? Who is going to help me sift through all this? Where am I going to put things once I remove them from here? Which charity will want seventy sheets of fancy wrapping paper, with most of them looking all pretty with the butterflies on them? I held them in my hand and asked myself if they sparked any joy in my heart. They kind of did, but I had to be practical. Would they be of any use to me? Not really. I compromised and kept the butterfly ones but most respectfully put the rest in a pile that was meant for giving away. Eventually, I got into the nitty gritty of it all and ploughed through until I was exhausted and saw it was nearing midnight. I’m learning how to spark joy in my heart, my life. The next day I decided to go into my bedroom and start on my closet. Please note that at this point, I had left the office as is from the night before. A right mess. I tackled my tee-shirts and neatly put them in a drawer. I actually looked up the #KonMari way to fold the tees so that I could reach them easily AND have enough space for them. I was silently marvelling at my neat tee drawer when I decided to jump into the closet again and sort my costume jewellery. Bad mistake. Bad, bad mistake. I tried on my fancy cocktail rings that I have collected over the years, each one with a memory tied to it. I admired my hand albeit the nail varnish which had now chipped due to the intense labour I had suddenly embarked on. Then, because of removing and putting on lots of rings, I think my fingers swelled up with all that blood rushing and the ugliest ring I had in that box got stuck on my ring finger on the right hand. Stuck. The rings were just STUCK! What does that even mean? Ring finger on the right hand? Anyway, I’m digressing. Back to my new drama. While trying to pull it off, I dropped my rings box. It’s a large A4 sized box with a glass top and rows of padded chenille where you can snugly rest your rings and access easily. That’s what I dropped. Not only did it land sharply on my right foot leaving me with the beginnings of a bruise, all my rings got scattered over the miniscule walk-in closet that reminded me of a shoebox-sized hotel room in New York. Naturally I let out a curse. THIS was NOT sparking any joy in my heart. As I bent down to pick the rings, I noticed in horror that with the impact of falling down, some of the rings’ stones and diamantes had become loose and fallen off. I was in tears. Was this how I was to let go of a collection I’ve built up since I was a teenager? I sighed and dramatically did that long shut-eye thing, as if I’m gaining strength from some unseen power, opened my eyes and sifted through the now broken rings. Let’s just say, after sorting the rings box, I did nothing else. I didn’t touch the bangles, bracelets, earrings, brooches, necklaces and other stuff that I hardly wear. By the way, it’s always the same three things that we always reach out for anyway. You know how it is, right? My Mum always said that I start something off with great enthusiasm and then I just leave it halfway through. Why do I do that? I think I get bored with the repetitiveness of it all. Mum used to say I’m like a butterfly. I flit from one thing to another. Maybe I do, but when I do make up my mind to do something, I will see it through. Eventually. Maybe. Perhaps. You think I stopped after I ruined the rings? Nope. I decided to tackle the *insert drumroll* bathroom. My bathroom is my haven. It’s not fancy, neither does it have expensive fixtures and fittings. It’s a very basic bathroom but what makes it interesting is my compulsive need to fill every empty space with bottles, vials, jars, tins, and boxes of things. At any given moment, I have at least four different shampoo bottles (and that’s on the lower side from when I’m too broke to buy ten), hair conditioner, bath gels, shower caps, loofahs, toothbrushes (despite owning an electric one that I stole off my sister and replaced with a new head), toothpastes, loo rolls, hand wash, antibacterial spray cleaner, hair dye, body lotions of different types, contact lenses, solution for lenses, dental floss, face wash, face masks, coconut oil, and saving the best/ worst for last – medicine. Look. It’s not that I am a hypochondriac but I tend to keep medication just in case something happens. This is a hangover from when my daughter was a wee little bubba and was prone to asthma. I had all kinds of syrups and medication that the paediatrician had recommended I keep stocked at home in case. This ‘in case’ scenario led to even more stocking of medication – simple, over the counter meds for holiday tummy, painkillers, flu and cold remedies – so that I wouldn’t have to be running out in the middle of the night looking for medication should the kids fall ill.
I’m now admitting that this has become a habit even though the kids are now teenagers and rarely ever need any kind of medication. I even travel with medication for my ‘just in case’ scenarios. Stop judging me. I’m not blowing the amount I can happily spend on a new pair of shoes on darned basic medication that costs the earth elsewhere in the world. Coming back to my stock of medication, I bit the bullet and decided to clear out the drawers where the medicines are stored. I had antihistamine that expired a year ago, and that was just the tip of the iceberg. I had fancy plasters with Disney characters on them just in case (that darned phrase again) the kids got an ‘ouchie’. With time, a simple kiss on the ouchie was acceptable, and soon enough it was uncool to have mummy pay attention to simple cuts and scrapes. They just got on with it. I threw out a whole bunch of medication, including prescribed stuff that never got finished. Out went the antacids, surgical gloves (please, don’t ask), half-consumed cough syrups, eye drops, everything! I even took pictures of the mess but I did not post it on Instagram. Give me some credit! The few that made it. Few. I promise. The bathroom got a total transformation, so much so my daughter was inspired to clean up her bathroom space too. We marvelled at each other’s hard work, gave each other tips on effectively using boxes to separate and organise, inhaled the fresh scent of the antibacterial cleaner, and congratulated each other on ‘sparking joy in the heart’. There’s no darn life lesson here. I just wanted to get it off my chest that after all these years of hoarding things, I may have finally started letting go, thus inviting a good, clean vibe around me that keeps me buoyant and wanting to admire my handiwork in the bathroom and my almost-clean office. One day in the near the future, I will tackle the closet, and then the kitchen. Loved loved the write ,the distracted part is so me ,I start with gusto clear I bit than land up with a bigger mess than I started of with . An excellent read…one most of us women can relate too…. n oh the emotional rollercoaster u go through looking at things u hold on too. This had me in hysterics….I can so identify! I did this after reading her book 2 years ago and my clothes drawers really do spark joy and M has a happy sock drawer. Then her show on Netflix started. And I had the urge to KonMari. Again. And lets leave it at – I am discombobulated. Enjoyed reading. I think all women relate to it in some way or another. Your style is writing is hilarious. You should consider doing a regular column in Nation again.